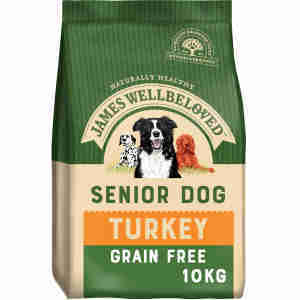 James Wellbeloved dog senior turkey and vegetables grain free is a complete hypoallergenic dog food. James Wellbeloved dog senior turkey and vegetables grain free has been specifically tailored to meet the needs of older dogs with digestive issues. Made using all-natural ingredients, it’s ideal for pets who suffer from food intolerances. This mix uses a single source of protein: high-quality turkey pieces. Using just one source makes it easier for your dog to digest their meal. Good digestion is essential for your pet to absorb the most nutrients from every mouthful. Protein also helps them to maintain lean muscle mass, which is vital for all of that running and playing they love to do. This mix has been enriched with omega-3 and omega-6 fatty acids, which help to keep your pet’s coat glossy and their joints in good condition. It has added yucca extract to help manage stool odour. Prebiotics support healthy gut function, while vitamins C and E help to improve the immune system. carbohydrates from vegetables give energy. It’s easy to tell if your pet is suffering from a food intolerance. If they vomit or have diarrhoea after eating or if they come out in a rash, it could be a sign that their food isn’t agreeing with them. Take them to the vets for a full check-up and diagnosis as soon as possible. James Wellbeloved can be used to replace your pet’s regular food for life. Try feeding them this mix for a trial period of 6-8 weeks to see if symptoms go away. If the allergy persists, take your dog back to the vet for further advice. Pea starch (28.3%), potato flakes (25.5%), turkey meal (23%), tomato pomace, turkey fat, whole linseed, turkey gravy, peas, alfalfa mea, pea fibre, carrots, seaweed, chicory pulp, Omega supplement, potassium chloride, sodium chloride, parsley, nettles, chicory extract, calcium carbonate, glucosamine, yucca extract, chondroitin. Antioxidants: E306/Natural antioxidant. 183 mg, Vitamins: E672/Vitamin A, 15000 iu,E671/Vitamin D3, 1400 iu, taurine: 1000mg. Trace elements: E1/iron, 133 mg E2/iodine, 3.3 mg, E4/copper, 20 mg E5/manganese, 40 mg, E6/zinc, 385 mg, E8/selenium, 0.44 mg. Protein 19.5%, Crude Fibres 4.5%, Crude Oils and Fats 9.5%, Crude Ash 7.2%. Really pleased. Ticks all the boxes for my dog. Prompt service too. My dog is very sensitive with food and we have many upset stomachs resulting in a lot of mess and discomfort. After trying many brands, this is the one that really suited him. He loves it and had had no further problems.